During our monthly flag raising, second graders shared thoughts about respect and sang about the 7 Habits with the Leader in Me song. Once again, the sixth grade from Salk raised money and traveled to Feed My Starving Children and packed food for hungry kids! Students and staff had fun walking through clouds of color during our first annual Color Run! Alyssa will represent Salk at our district spelling bee. Brian is the runner-up. Students are taking on leadership roles when they notice something needs to be done! These great leaders are super proactive and step up to help without being asked. Salk Band and Orchestra programs performed for students and families this week. Students, staff, and parents walked, trotted and ran around the field during our annual Turkey Trot to promote fitness and fun. Student Council collected 582 pairs of socks from Salk students and families to donate. 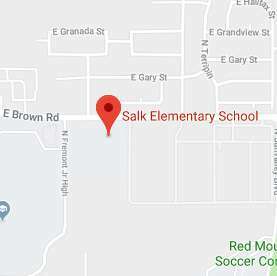 The JROTC from Red Mountain High School sends a team monthly to help Salk with their Flag Raising. Today was an extra special day, student officers spoke to our students about service. We are thankful that the JROTC are great role models for our students. Salk Kindergartners celebrate Veteran's Day by singing Grand Ole Flag for Salk's Flag Raising. They did a great job! Stop by to see our new Leader in Me mural in the office. Salk started this program, based on the Seven Habits of Highly Effective People in August. Watch for changes around our campus and how our students growing into new leadership roles! It's exciting! Salk student leaders help with Flag Raising. Salk was surprised today with an Award of Excellence for the appearance of our buildings and surrounding landscaping. This reflects the hard work of our Facilities Assistant, David Morris, Night Lead, Donnie Maddox, and Groundskeeper Bob Peppett. Way to go!!! Friendly and Welcoming Smiles Await You When You Visit Salk. Our students are becoming stronger leaders each day! New Opportunities Await YOU....Just reach up your hand and hold on tight! Parents-please take a few minutes to fill the Leader in Me survey for our school. Your input is appreciated. The survey takes about 5 minutes to fill and can be accessed by your smart phone. Students click on the link below to fill out the Leader in Me survey. 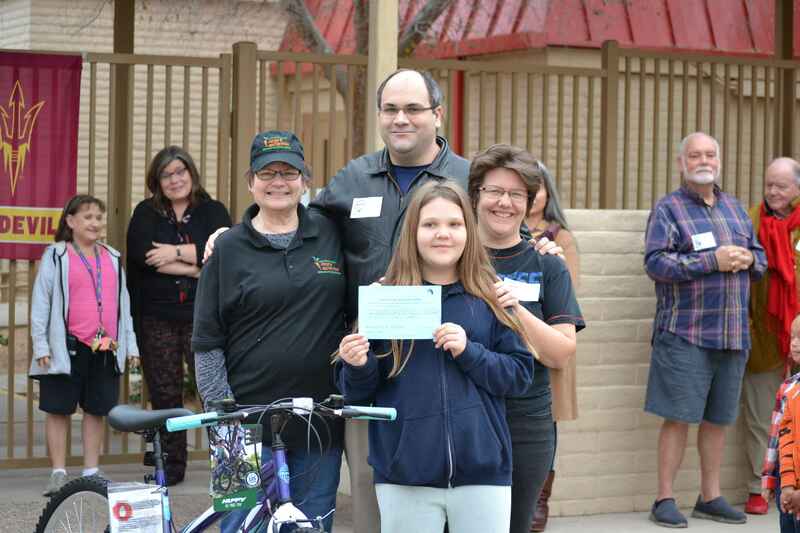 Gillian wins a new bike for her 100th Day of School entry with Food and Nutrition. Congratulations! 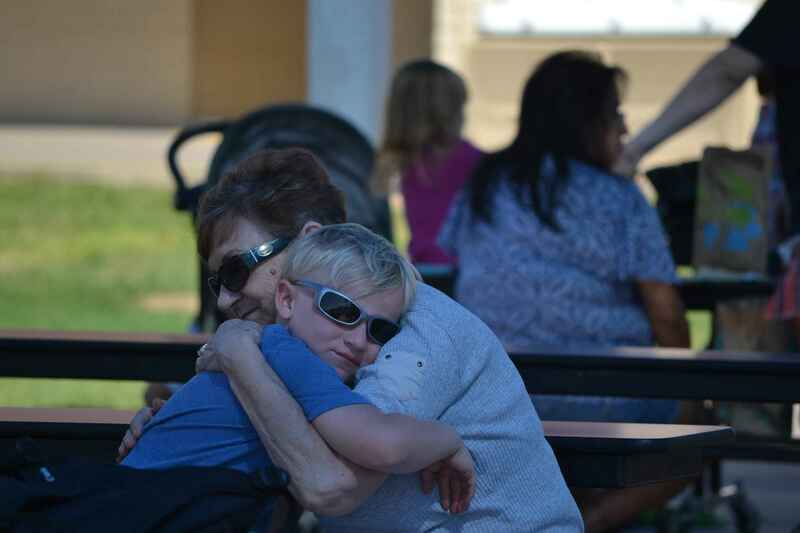 At Salk, we value the contribution that families make to our school community.